I occasionally get some criticism for insisting that high estradiol levels are as potentially dangerous for men as low. I also have seen many men on The Peak Testosterone Forum whose doctors have told them that high estradiol levels were actually protective. I could not disagree with this more for many reasons, especially the fact that it accelerates arterial plaque according to a number of studies. Considering that heart disease is the #1 killer of men, it should be obvious in my opinion that high estradiol is not a good idea for the great majority of men. You can read more about it here: Estradiol and Arterial Plaque. "Paradoxically, the incidence of prostate disease increases with age when serum androgen levels are in decline and emerging evidence suggests that estrogens may also be important in the normal prostate, as well as in the etiology of prostate disease. Both estrogen receptor subtypes are present in the prostate, demonstrating that the gland responds directly to estrogens. Recent data suggests that estrogens play a role in prostate disease and has demonstrated that high doses of estrogens induce premalignant dysplasia and in combination with high doses of androgens, malignancy. " "The mean molar ratio of testosterone: E2 was lowest among CaP patients (134:1) and highest among controls (166:1)." "Significant positive correlation between PSA and 17ÃŸ-estradiol was observed in prostate disorders (BPH and CaP patients." "Significant negative correlations between testosterone and PSA were also observed among BPH patients (r = -0.221, p = 0.049) and control subjects." "No significant correlation existed between testosterone and PSA in CaP patients." This still has, as of yet, to be directly tested in humans. However, it has been verifed in dogs where prostate growth was found to increase prostate volume in a dose dependent fashion. Furthermore, this was done in the absence of androgens (DHT, testosterone, etc.) as the animals had been castrated. This study, though, was rather clear: they lowered testosterone down to the minimum and then gave the animals estradiol. The more estradiol they gave, the bigger the prostate. Again, higher estradiol levels are just hard on the prostate and likely a culprit in many issues for men. I remember getting chewed out by a member on The Peak Testosterone Forum for suggesting that estradiol could cause prostate growth. I didn't say much, because this poor guy had struggled with BPH and other medical issues. CONCLUSION: There is a very good chance that high estradiol is very hard on the prostate and potentially dangerous for men. Hopefully, more study work will be done to determine just what a "high estradiol" level may be. (Considerable individual variation does occur however.) 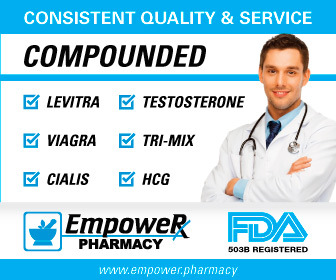 What can you do to lower estradiol? Of course, the number one thing is to lose weight. Fat cells store aromatase, the enzyme that converts testosterone into estradiol. So the more body fat you carry, the most aromatase and the higher your estradiol levels tend to be. (It's actually a bit more complicated that that and you can read the discussion in my page on Testosterone and Weight Loss. So I encourage you to drop the pounds. I like Clarence Bass' approach and how he encourages men to drop their body fat percentage below 15%. He personally kept his body fat year round well below 10 percent and had considerable muscle mass as well. See my pages on Challenge Yourself (Clarence Bass) and An Interview with Clarence Bass on Bodybuilding and Losing Weight. 1) Differentiation. 2011 Nov-Dec;82(4-5):184-99, "Androgens and estrogens in benign prostatic hyperplasia: past, present and future"
2) Toxicol Appl Pharmacol, 1996 Feb, 136(2):211-9, "Possible mechanism of induction of benign prostatic hyperplasia by estradiol and dihydrotestosterone in dogs"
3) The Prostate (Impact Factor: 3.57), 44(1):8-18. "Estradiol causes a dose-dependent stimulation of prostate growth in castrated beagle dogs." 4) Rev Urol. 2005, 7(Suppl 9): S3â€“S14., "Benign Prostatic Hyperplasia: An Overview"
6) Minerva Endocrinol. 2006 Mar;31(1):1-12, "Aromatase and prostate cancer"
7) Eur J Cancer, 2008 May, 44(7):928-36, "A potential paradox in prostate adenocarcinoma progression: oestrogen as the initiating driver"
8) Indian J Clin Biochem, 2015 Jan, 30(1):59-65, "Serum Testosterone, 17Î²-Estradiol and PSA Levels in Subjects with Prostate Disorders"